« If Israel Can Find Common Ground around the Environment, Why Can’t Texas? The Block Island Wind Farm in Rhode Island. Photo courtesy of Deepwater Wind. 2016 was a big year for progress in the U.S. power sector. Renewable energy sources provided 16.9 percent of the country’s electricity in the first half of 2016, up from 13.7 percent for all of 2015. 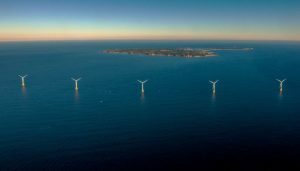 The country’s first offshore wind farm opened off the coast of Rhode Island. Most importantly, carbon emissions from the power sector are projected to continue to decline and hit levels not seen since 1992. Strong leadership by forward-thinking governors, policymakers, and power company executives who recognize the imperative of lower-carbon generation and the promise of clean energy, powerful market forces intensifying the push to lower-carbon resources, and the critical federal regulatory overlay of the Clean Power Plan — which has made clear that unlimited carbon pollution is a thing of the past — have all combined to deepen a trend towards cleaner electricity production at this dynamic moment in time. Even with any possible political maneuverings in Washington, D.C. to reverse clean energy and climate progress, it is clear that the transition to a low-carbon future is well under way. States and power companies are surging ahead — and given the favorable economics of clean energy and the urgent need to reduce climate-destabilizing pollution it would be foolish to turn back. More than 21 gigawatts of wind and solar power (utility-scale and rooftop) are projected to have been installed in 2016, accounting for 68 percent of new U.S. capacity additions. That’s according to analyses by FERC, SNL Energy, EIA, and SEIA/GTM Research. Some of the country’s oldest and least efficient power plants were scheduled to close in 2016, transitioning 5.3 gigawatts of capacity, in no small part due to increasingly favorable economics for low-carbon generation. Since 2014, solar installation has created more jobs than oil and gas pipeline construction and crude petroleum and natural gas extraction combined. According to recent reports, there are now more than 400,000 jobs in renewable energy. Together, these trends indicate the U.S. power sector is well-positioned to continue to reduce carbon pollution at a significant pace. And because of the favorable economics for low-carbon generation and the urgent need to protect against climate risks, hundreds of major corporations are on record supporting the Clean Power Plan and the achievement of emission reduction targets. Power sector carbon emissions declined to 21 percent below 2005 levels in 2015, and are expected to drop again in 2016, meaning the power sector is already two-thirds of the way towards meeting its 2030 pollution reduction goals under the Clean Power Plan. States and power companies lead in cutting carbon. Notably, this de-carbonization of the electric sector has proceeded while the U.S economy has grown. In addition, recent analysis by the Brookings Institution shows that as of 2014, at least 33 individual states have also decoupled their economic growth from carbon pollution — continuing to grow their gross domestic product while significantly slowing their rate of greenhouse gas emissions. Heading into 2017, companies from coast to coast are well-positioned to secure ongoing reductions in carbon emissions from their fleets – thereby helping the United States to achieve international commitments under the Paris Agreement, delivering greater value to customers and shareholders while ensuring state or municipal policy objectives will be achieved, and sharpening their ability to meet declining emissions limits in accordance with a federal regulatory framework. Even the vast majority of states litigating against the Clean Power Plan can comply with the CPP targets by optimizing the carbon pollution benefits from already planned investments and compliance with existing state policies. The Clean Power Plan is crucial to making certain that states and companies take advantage of the opportunity to ensure the carbon reduction potential of these investments are fully realized, so they can in fact achieve these reasonable protections. De-carbonization of the electric sector has proceeded while the U.S economy has grown. The shift to a lower-carbon future should continue, as power companies recognize both the imperative to reduce emissions and the benefits of moving in this direction despite changing political winds in Washington. Acting on these commitments, many power companies are continuing to expand their renewable investments while phasing out high-carbon generation, putting them in a solid position to comply with robust carbon pollution regulations. At the end of December, Florida Power & Light (FPL) showed strong leadership when announcing plans to shut down the recently-acquired 250-megawatt Cedar Bay coal plant at the end of the year. “I’m very proud of our employees for proposing this innovative approach that’s environmentally beneficial and saves customers millions of dollars,” said CEO Eric Silagy. FPL plans to replace the retired power with natural gas and solar — the company added 224 megawatts of solar capacity in 2016. FPL also noted that their system is now “cleaner today than the 2030 carbon emissions rate goal for Florida outlined by the Clean Power Plan,” while average residential bills are about 30 percent lower than the national average. On December 30, Southern Company announced an agreement with Renewable Energy Systems America to develop 3,000 megawatts of renewable energy scheduled to come online between 2018 and 2020. The agreement comes as Southern Company continued to boost its renewable portfolio with the acquisition of 300 megawatts of wind power in late December, bringing its total to more than 4,000 megawatts of renewable generation added or announced since 2012. Duke Energy acquired its first solar project in Colorado on Dec. 8. The purchase advances Duke’s goal of owning more than 6,000 megawatts of renewable energy projects by 2020. After the election, a number of power companies reiterated their commitment to reducing air pollution and meeting their obligations under the federal Clean Air Act by transitioning aging coal plants. PNM Resources spokesman Pahl Shipley said the company has no change in plans for retiring two units at a New Mexico plant, totaling 837 megawatts of capacity, in 2017. PNM will replace the retired capacity with solar and nuclear power. The Tennessee Valley Authority is moving forward with plans to retire two coal plants in 2017, as well as a third in 2018. Colorado-based electric cooperative Tri-State Generation will move forward with plans to retire its 100-megawatt Nucla coal plant and Unit 1 of the Craig coal plant. “We are moving forward with retirement activities and developing a transition plan for the employees and communities,” said Tri-State spokesman Lee Boughey after the election. Duke Energy acquired its first solar project in Colorado on Dec. 8. These announcements follow one of the biggest clean energy leadership stories of 2016 – commitments by two midcontinent utilities, Xcel Energy and Berkshire Hathaway Energy, to go big on cost-effective investments in new wind resources. This past year, Minnesota regulators approved a plan for Xcel Energy to construct as much as 1,800 megawatts of new wind power and 1,400 megawatts of solar in the state by 2030. Xcel also received approval to build a 600 megawatt wind farm in Colorado. On December 7, Illinois enacted a comprehensive new energy bill that will in part double the state’s energy efficiency portfolio and allow for 4,300 megawatts of new solar and wind power while providing for continued operation of zero-emission nuclear facilities. These measures are expected to reduce the state’s carbon emissions 56 percent by 2030. Also in December, Washington Governor Jay Inslee proposed the state adopt a first-of-its-kind carbon tax of $25 per metric ton of carbon pollution. The proposal supplements the state’s innovative Clean Air Rule, adopted in September, which caps carbon emissions from individual polluters. Nine states comprising the Regional Greenhouse Gas Initiative are engaged in a stakeholder process designed to establish new, more protective, standards for climate pollution. In Oregon, regulators are evaluating options for a market-based mechanism that could link to the California-Quebec carbon market, releasing a partial draft report on November 21. Governors such as Colorado’s John Hickenlooper continue to display strong leadership and a keen understanding of the imperative to move to a low-carbon future. After the election, Hickenlooper said he remains committed to fulfilling the goals of the Clean Power Plan, no matter what happens to the rule. In California, Governor Jerry Brown mounted a vigorous defense of California’s climate leadership and the role the state will continue to play in setting the stage for ongoing progress and defending the important progress of the last eight years. “We’ve got the scientists, we’ve got the lawyers and we’re ready to fight. We’re ready to defend,” he said. The momentum that power companies and states have generated towards achieving a clean energy future is powerful and encouraging. Looking to 2017 and beyond, market trends are expected to continue to help facilitate de-carbonization of the electric sector, while federal and state policies must continue to provide certainty about the pace and depth of emissions reductions needed to address the threat of climate change. These policies will help companies plan clean energy investments in a way that maximizes benefits for consumers and facilitates optimal deployment of available resources. The Clean Power Plan remains crucial to achieving these goals. Any disruption in the Clean Power Plan’s implementation could put long-overdue and readily achievable emission reductions at risk. As we ring in the New Year, EDF will keep working with a diverse set of stakeholders across the country — including many state officials and power companies — to defend these critical environmental safeguards. At the same time, we will work vigorously to ensure that we achieve the reductions in carbon pollution envisioned by the program. This post originally appeared on our Climate 411 blog. With the technology of Carbon Capture Utilization over 90% of the CO2 can be removed from the combusted fossil fuel exhaust and be transformed into useful – saleable products. This will not only benefit the environment but America’s economy by creating millions of jobs across the country.